Just a few metres from the entrance of HOTEL SOVESTRO, where the unique nature of the landscape enables peaceful enjoyment of the seasonal colours, lies the exceptionally welcoming "da Pode" Restaurant. Cleverly renovated to maintain the original architectonic and decorative details of old-fashioned rural style - beams and stone, terracotta floors - the restaurant is situated in an old farmhouse with a chimney that delivers happily inviting scrolls of smoke. Inside, the spacious rooms and the splendid veranda, where meticulous attention is dedicated to country style furnishings and the elegant preparation of every table, introduce the restaurant's guests - both those staying at the contiguous HOTEL SOVESTRO and otherwise - to exclusive intimacy, enhanced mainly by the balance between tradition and nature. 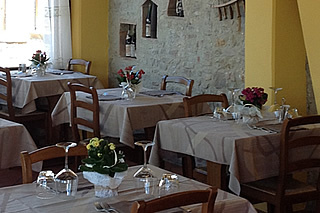 The balance between nature and tradition returns in the cuisine of the "da Pode" Restaurant. All the dishes, prepared and served under the watchful eye of Lucia, are created using modern restaurant utensils and, most importantly, only the freshest, locally produced ingredients and the varied recipes typical of the House and of internationally famous Tuscan cuisine. The choice of wines is also excellent: living up to the expectations of what one would expect to find in a geographic area with a winemaking vocation of which the nation is rightfully proud. The rest is performed by the affable, constant willingness of the proprietors to create the best possible atmosphere among diners.